Originally published on The Football Collective here. The recent CIES Football Observatory Monthly Report investigated the international mobility of minors in football. The findings suggest a trading or mobility network of under 18yr old male athletes. However, they do not necessarily interrogate and unpick this network, which might show how it is structured globally and locally. This short blog post aims to extend their findings and explore the structure of the trade network regarding minors within football. Indeed, there are many ethical, moral, economic and, of course, legal debates to be had on the matter (the latter two can be read further in FIFA’s regulations on the transfer of players and KEA’s and CDES’ report). There is a long history of academic research focussing on the labour market within professional association football – especially in Europe. Walters and Rossi (2009) edited series of research papers investigating the issues and challenges of Labour Market Migration in European Football – focusing on concepts such as, muscle drain, feet drain and feet exchange. On top of this, Frick (2007) empirically inspected the major European leagues’ labour market. Other research has focussed on Africa’s role within the European labour market, such as – Poli (2007) who provides specific insight into Africa’s status in the European Football Labour Market; and Darby (2000; 2007) who looks at African football labour migration to Europe and African labour migration to Portugal respectively. More recently, Bullough, Moore & Goldsmith (2016) examined UEFA’s home-grown rule and player’s migration and opportunity, and Rossi, Semens & Brocard (2016) book which explored the role of sport agents within football’s labour market. Other useful books on the topic, consist of Maguire’s (2010) Sport and Migration: Borders, Boundaries and Crossings, Elliot & Harris’ (2014) Football and Migration: Perspectives, Places, Players and Tiesler & Coelho (2008) Globalised Football: Nations and Migration, the City and the Dream. The recent CIES Football Observatory Monthly Report highlights a very controversial issue within the European Football Labour Market – namely the migration of minors. Of course, this raises moral and ethical implications, that will stir a range of opinions. Darragh McGee seems to be at the forefront of minor migration within sport, so readers are directed to his 2012 book Displacing Childhood: labour exploitation and child trafficking in sport, or his conversation article last year What the next FIFA president could do to tackle child trafficking in football. Additionally readers may find Brackenridge et al. (2013) Child Exploitation and the FIFA World Cup: A review of risks and protective interventions useful. Nevertheless, the purpose of this blog post is to further interrogate the network of minor migration presented by CIES, without providing judgement on the topic or its implications. The CIES report that within the top 5 major European leagues (Premier League, Liga, Ligue 1, Bundesliga and Serie A), the percentage of players migrating increased from 24.1% to 55.2% from 2009 to 2015. Additionally, over the same period the average age dropped from 23.2 to 21.1 respectively, which is attributed to the increase in minor migration figures, which in 1995 was 51 and in 2015 was 184, most of which the final destination was England. The report goes further to include a section on the ‘Networks’, and provides useful information regarding the relational direction, and flow of minor’s migration in football. Within this section they include information on minor’s migration across Europe in October 2016, but they don’t locate the work in a social network analysis framework, so therefore cannot show how the network is configured. Here we use the information in the report and place it with an SNA. The below figure shows the data held in the report in network form. This is a small-scale network based on the information provided in the CIES report, relating to the movement of minors as of October 2016. So whilst it offers an insight into the migration flow, it doesn’t explain net migration and is only a snapshot in time. Obviously, much of this network could have been deducted through Figure 7 in the CIES report. Including that England is the clear end destination. But SNA allows us to look a bit more critically at the structure. 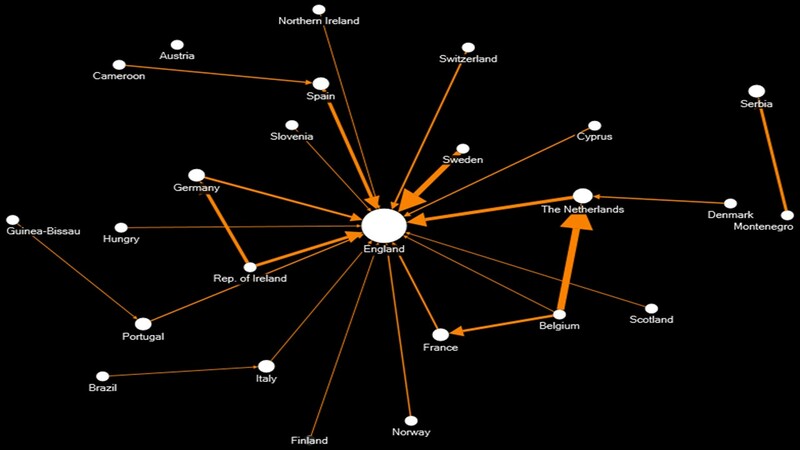 In network terms England has the highest in-degree and betweeness values within the network – which is a characteristic of a star topology seen here – suggesting that the England node (represented as a circle) has the most connections going into it or in this case, the majority of minor migrants from other countries migrating to England. However, England has the smallest (or none to be exact) out-degree, meaning no minor football players migrate abroad. It is Belgium who has the largest out-degree value, as they have the largest number of minors migrating, primarily to The Netherlands, and secondarily France and England. Again, deductible from the report. What is not so deductible from the report is the structure of the network, so if we look a little closer, and apply K-core (clique of countries) (this establishes a core of nodes, or countries in this case, which are interlinked – this is a relaxed clique in that not every country (node) in the core is linked symmetrically), we find a number of countries (nodes) which were fundamental to the international transfer of minors across Europe as of October 2016. Therefore, we can depict that England, Belgium, The Netherlands, France, Germany and the Republic of Ireland, are all embedded to the mobility of minor footballers within Europe. Thus, research is needed to track this network historically, and continuously to investigate net-migration of players over time – and account for the impact of huge political changes across Europe, such a Brexit and the right populist movement. Considering the centralised structure of the network, then political shifts affecting the (K-)core, such as Brexit, could have detrimental implications on the network robustness. Finally, research of this nature could aid policy decisions, by providing evidence of whether we need tighter interventions to control the movement of minors within football across Europe. Next Opinion: Can council-funded sport survive austerity?